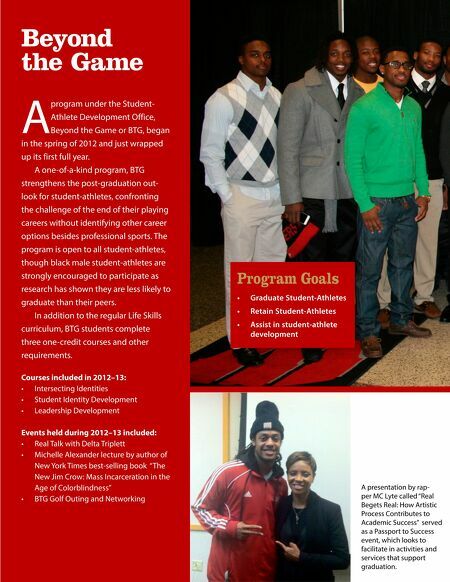 Beyond the Game A program under the StudentAthlete Development Office, Beyond the Game or BTG, began in the spring of 2012 and just wrapped up its first full year. 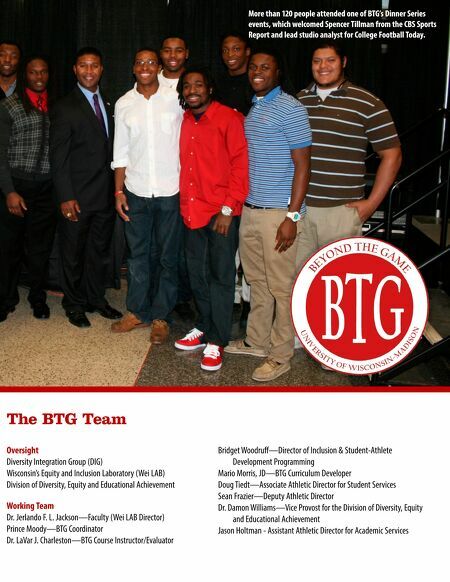 A one-of-a-kind program, BTG strengthens the post-graduation outlook for student-athletes, confronting the challenge of the end of their playing careers without identifying other career options besides professional sports. The program is open to all student-athletes, though black male student-athletes are strongly encouraged to participate as research has shown they are less likely to graduate than their peers. In addition to the regular Life Skills curriculum, BTG students complete three one-credit courses and other requirements. Program Goals • Graduate Student-Athletes • Retain Student-Athletes • Assist in student-athlete development Courses included in 2012–13: • Intersecting Identities • Student Identity Development • Leadership Development Events held during 2012–13 included: • Real Talk with Delta Triplett • Michelle Alexander lecture by author of New York Times best-selling book "The New Jim Crow: Mass Incarceration in the Age of Colorblindness" • BTG Golf Outing and Networking A presentation by rapper MC Lyte called "Real Begets Real: How Artistic Process Contributes to Academic Success" served as a Passport to Success event, which looks to facilitate in activities and services that support graduation.